The is a common diurnal monkey found in Kerala., occurring both in the forests and villages . The troop size may range from 10 to 20 individuals. Local names : Vellamanthi , Nadan kurangu, Mocha, Vellakurnagu. Habitat : Moist and dry deciduous forest, semi and wet evergreen forest, edges and country side. Distribution : Distribution all over Kerala. Commonly found in Parambikulam. Wayanad, Idukki and Chimmony wildlife sanctuaries. Indirect evidences : Faecal matters, discarded leaf portions on the ground , parts of fruits dropped after feeding, calls, foot prints on the ground and banging sound of tree branches when they jump swiftly. Faecal matters Colour : Grayish to black and smooth in texture. Similar to humans in shape and found on rocky patches or on the ground. Foot prints : Foot prints are traceable near the river banks. Calls : Sounds like “ Kra…Kra…Kra…” is produced by all the individuals in a troop. Gives out a shrill warning call by all the members simultaneously, when a bird of prey soar over the sky, or when predators are sighted. 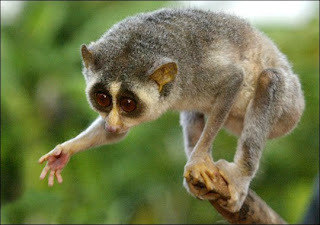 The only nocturnal primate in Western Ghats. Usually move fast when encountered. Reported from many of the wildlife sanctuaries, but found to be common in certain pockets of Wayanad Wildlife Sanctuary and parts of Trichur District. Local name : Kutti thevangu. Habitat : Deciduous, bamboo and thorn forsts. Distribution :No correct information is available. However, it has been reported from all over Kerala. Indirect evidences : Indirect evidences cannot be traced easily and hence hardly dependable. Have a low whistling call audible to 30-40 m.
Be heard from distance in early morning and evening. Local name : Karim kurangu, kari manthi. Habitat : Wet evergreen, semi –evergreen and deciduous forest. Distribution : All over Kerala in the forested areas from an elevation of 90 m above MSL. Indirect evidences: Droppings, discarded leaf and fruit parts on the ground and calls. 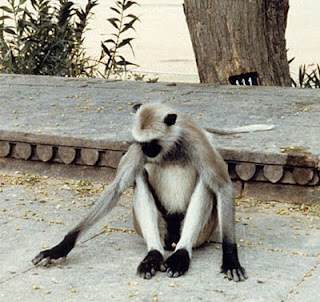 Droppings : Similar to hanuman langur but difficult to locate in the forest areas. Being the more abundant, foot paths and rocks along streams. More often look like cow dung,with no invertebrates and usually flattened on the substrate. Colour : Grey, green or black. Foot prints : Foot prints are not traceable in the wild since these monkeys seldom come down . Calls : “Hoo…hoo…hoo…” Distinct calls heard from a distances will help us to identify these monkeys. Produces of a shrill sound by all the members of a troop whenever a bird of prey soars over the canopy., or when a predator is sighted. This diurnal monkey is found in the dry tracts in Nilambur and ,Wayand and Chinnar Wildlife Sanctuaries. Distinct call are made by these monkey. Difficult to distinguish based on indirect evidences. Sound of teeth grinding and whooping calls of males are audible. Local names : Hanuman kurangu , Vekkali, Vellamanthi and Moolikurangu. Habitat : Dry deciduous forest and scrub forests. Distribution : Found in chinnar and Wayanad Wildlife Sanctuaries in Kerala and parts of Nilambur. Thenmala and in sacred groves of North Kerala. Indirect evidences : Droppings, calls, discarded leaf, fruit parts and foot prints on the ground. Rejected fruit portions of Garcinia gummi-gutta, are usuall seen in Chinnar Wildlife Sanctuary,when these monkeys leave an area after feeding. Faecal matters : Found on the ground or on rocks under the roosting tree /place. Droppings Contain mostly leaves unlike bonnet monkeys and with no insect parts. 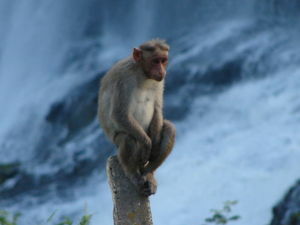 Colour : Brownish grey, shape is similar to bonnet macaque. Calls and sound :” Whoop…Whoop…Whoop…”. Foot prints : Foot prints can be located near the water course where these monkeys Inhabit. Difficult to identify from other primates based on the foot prints Because the foot prints may look similar. 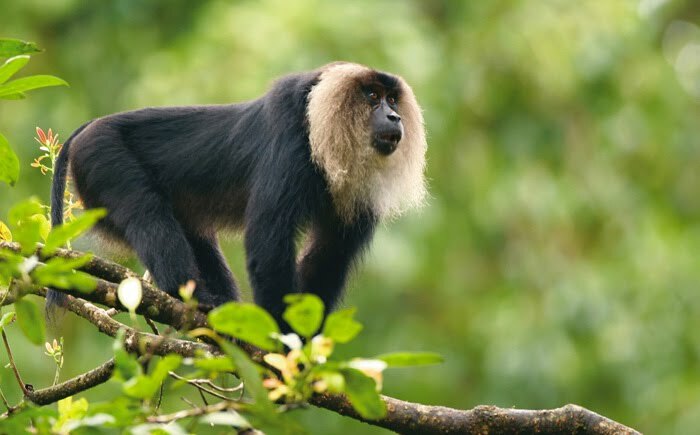 This macaque is diurnal, endemic to the evergreen forests of Western ghats and is the most endangered among all the primates found in Kerala. 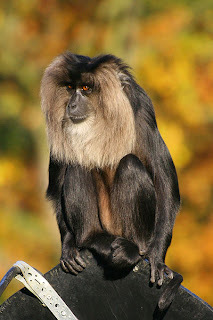 Their subdued ‘’Coo-Coo-Coo’’ call is very distinct from that of the other black monkey,the Nilgiri langur. They occur in troops of 10 to 20 animals. Freshly discarded fruits of Cullenia exarillata with feeding signs more often indicate the presence of this monkey in the vicinity. Local names : Simhavalan kurangu , Shingalan, Moolian. Habiat : Wet evergreen forest. Distribution : Seen in the wet evergreen forests in Kerala, Tamil Nadu and Karnataka. 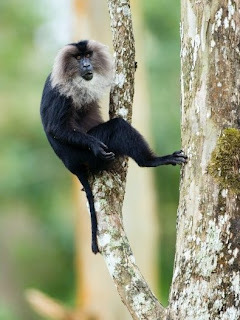 In Kerala it occurs in Silent valley National park, Shenduruny Wildlife Sanctuary, New Amarambalam, Muthikulam, Parambikulam, Sholayar,Periyar Tiger Reserve, Aralam, Ranni, Nelliampathy and Neyyar. Indirect evidences : Discarded parts of fruits, calls, sound of moving branches and faecal matters reveal the presence of these monkeys. It is difficult to find foot prints. Rarely comes to ground and foot prints will be confused with that of bonnet macaque.Discarded food parts can be indistinguishable from other arboreal mammals e. g. Nilgiri langur, bonnet macaque and Malabar giant squirrel, except perhaps for some specific food species e. g. Cullenia sp. and Diospyros. Dropping : Similar to bonnet macaque, but difficult to locate in the evergreen forests. Colour : Grayish to black in colour. Calls : ‘’Coo…Coo…Coo…’’ contact calls are frequent. These calls are very reliable, audible and can be herd up to 75-100 m.